Please grab your American flag and walk with us up to 21 miles. March to the Capitol is NOT about politics. It is a 21-mile memorial walk in memory of those who lost their lives on September 11, 2001. 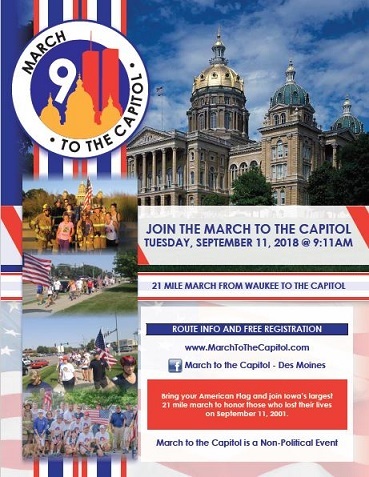 If you can join us for the entire route, we will be walking 21 miles from Waukee to the State Capitol. Otherwise, please grab your American flag (any size) and join us for a distance suitable to your schedule and ability. The walk begins at 9:11 am on Tuesday, September 11th. We will make 7 rest stops at fire houses for 10-20 min each. The 21 mile distance represents our walking 21 gun salute. This memorial walk was started because of the St. Louis "March to the Arch", which now has over 600 participants! To catch the vision for the future of the March to the Capitol, please see pictures from the St. Louis walk, under the "walk history" tab. Also, here is an inspiring video from the founder of how the March to the Capitol started. There is no cost to participate in this walk. The starting point will be at Centennial Park (in Waukee located at 1255 Warrior Ln. ), in the parking lot adjacent to the sand volleyball court and baseball field and we will finish on the west grounds of the State Capitol in front of the water fountain. The walk is free. However, please register to attend this walk. We need to know how many participants we will have so we can provide ample food, Gatorade, and water. Note: At this time, March to the Capitol will not be providing return transportation. The 1st 100 to sign up will receive a FREE T-shirt!